Eat Stop Eat Expanded Edition is the newly released update of Brad Pilon’s three-year-old book about intermittent fasting. This is the first and only review you’ll need to read on it. Right off the bat, let me say that the new edition is a tremendous improvement over the original Eat Stop Eat. Brad has given me an OK to quote some passages that I found particularly interesting and would be enlightening for my readers; this is a Leangains exclusive. I’ve also linked to the references provided in the book. These are just snippets. There’s plenty more good stuff in the book. After thoroughly reviewing the available research, I found that short term fasting does not negatively affect testosterone levels. More prolonged fasts seem to be associated with slight decreases in Testosterone levels. A 58-hour fast has been noted to cause reduced morning serum Testosterone measurements by the third straight morning of fasting; however, these measurements were still well within the normal range for healthy adults. In fact, other studies have found that it takes about 9 straight days of fasting before a significant decrease in Testosterone levels is observed. Research examining the effects of brief fasting (14-18 hours) over 21 days found that testosterone levels were not affected by almost a month of short-term fasting. The basic story is that if they don’t eat every three or four hours then they become hypoglycemic and become irritable, moody, light-headed and shaky. I find this an interesting phenomenon considering as little as 5-10% of the population actually has a malfunction in their ability to regulate their blood sugar levels. There is no actual cut off value for blood glucose levels that truly defines hypoglycemia for all people and purposes. According to the research I reviewed on the effects of short term fasting on blood sugar, a 24-hour fast should not place you into a hypoglycemic state, and I have not seen any research that has shown a subject going below 3.6 mmol/L blood sugar during a short term fast. Brad later explains what those people who apparently can’t go a few hours without keeling over really are suffering from. It ain’t “low blood sugar”…and if I got a dollar each time I heard someone complain about that, I’d be a millionaire by now. In a test where twenty-one university aged people were asked to perform a series of intellectual tests after having either a normal meal, skipping one meal, skipping two meals or going 24 hours without food, researchers found no difference in performance on measures of reaction time, recall or focused attention time. This led the authors of the study to conclude that short-term food deprivation did not significantly impair cognitive function. These results have been confirmed in additional studies where healthy young adults ate as little as 300 Calories over a two day period and experienced no decrease in tests of cognitive performance (including vigilance, choice reaction time, learning, memory, and reasoning), activity, sleep, and mood). Q: Sometimes when I fast my finger tips get cold, why is that? Fasting increases the blood flow to you body fat (the process is called adipose tissue blood flow). So when you are fasting more blood is travelling to your body fat, presumably to help move it to your muscles where it can be burned as a fuel. Do to this increased travel to your body fat, micro-vasodilation occurs in your fingertips and sometimes toes to compensate. So in some cases it’s a ‘necessary evil’ in the fat loss process. I’ve heard people mention cold fingers, hands and feet after longer fasting periods so the above is a good addition to the FAQ at the end of the book. OK, now on with the formal review. Anyone interested in intermittent fasting: the science behind it, as a lifestyle, or as a way to lose fat and maintain leanness. Besides learning how to practice the Eat Stop Eat lifestyle, this book covers topics pertaining to intermittent fasting and metabolism, health, body composition, hormonal effects and much more. The book is almost twice as long as the original Eat Stop Eat – and it’s 100% interesting and valuable information, not useless filler material. Brad has added information and research on the effects of fasting on testosterone, leptin, cortisol, inflammation, fasted training, whole new chapters devoted to blood glucose and fasting, fasting and the brain, workout design, and more. The FAQ is also greatly expanded. I was very impressed with the plethora of new information and how it was presented. To be honest, and this is just the cynic in me speaking, I only expected fluff and maybe some more on the practical side of things. One of the weak points of the original was Pilon’s advice and recommendations for resistance training. Instead of advocating heavy resistance training to maintain or gain muscle during dieting, Brad linked to some of his affiliates circuit training workouts. Not so in this edition. Instead, Brad covers resistance training basics and research, and offers solid non-retarded advice to go with it: i.e. the importance of progressive overloading, guidelines regarding training frequency, volume, etc. The new chapter on workout design is a very welcome addition for beginners purchasing the book. I am also pleased to see that Brad and I are on the same page when it comes to cardio for fat loss (which is that it’s a poor return on your time investment). Very newbie friendly, yet well referenced and scientifically accurate. This is the only book on the market with a substantial collection of research on intermittent fasting. Does a good job of dispelling the various diet myths out there: “starvation mode,” the claim that you will lose muscle if you don’t eat every so often, and much more. There are no calorie/macronutrient specific guidelines given in this book, which might be a problem for some people. Of course, if you have a good grasp on calorie counting and such, this is a non-issue. On the other hand, I think Brad left out meal plans/nutritional guidelines intentionally, since he pushes this as a lifestyle diet rather than a “diet” diet, so to speak. If I have to to nitpick: Brad talks a lot about the importance of low insulin for fat burning and fat loss. While he does not state anything outright incorrect, it might give the beginner the impression that maintaining low insulin is absolutely critical to lose fat. That in turn might lead to the conclusion that lower carb diets are preferable to higher carb diets, and so forth. On the other hand, he does mention the importance of calorie intake rather macronutrient intakes and backs this up with references. There is also one part where Brad talks about a “glucagon-dominant” metabolism for fat loss, which is not the case (glucagon does not cause fat burning). In one part Brad also cites a researcher who claims that “the idea that there is golden period of getting amino acids into your muscles is speculative at best,” which is untrue. Several studies show increased muscle protein synthesis when protein is consumed pre-workout. This is the only claim I take major issue with. I rarely give praise or a glowing review unless it’s warranted but Brad deserves one. While I don’t agree with Brad’s views about protein (as stated in his protein book; however, he does mention the positive effects of high protein intake during dieting in this one), there’s not much I disagree on, or can critique, here. It’s in every way a significant improvement over the original, which was already a good book. If you’re remotely interested in the topic, get this. You will not regret it. Is it worth the purchase if you have the old Eat Stop Eat? For someone like myself, a total geek about intermittent fasting and the research surrounding it, definitely. With the material Brad added, this is one of the best and most interesting books on physiology and dietetics I have ever purchased. I rank it right up there with Lyle McDonald’s books. 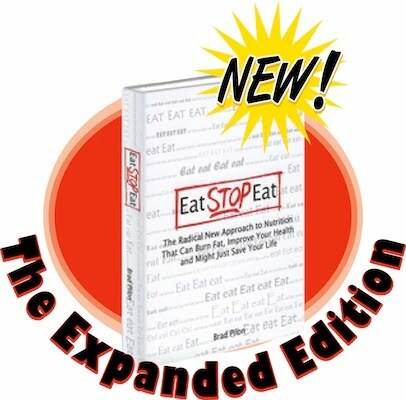 Eat Stop Eat Expanded Edition is a fantastic contribution to the intermittent fasting community.